While much of the Maui oceanfront real estate for sale today is dedicated to condominiums and resorts, buyers will still find single-family properties on the water as they explore the 120 miles of coastal land in Maui. Whether directly on the water, on a cliff overlooking the ocean or across the street from the water, Maui oceanfront homes for sale command excellent prices and draw interested buyers who are looking to enjoy life on the ocean. The appeal of oceanfront homes for sale in Maui is nearly universal. When a buyer is purchasing a home on a tropical island, that buyer often wants to see the water from the home every day. The blue waters and white sands are what draws buyers to Maui to begin with, and purchasing property on the water simply makes sense. Because Maui oceanfront homes for sale epitomize the typical island experience, they command a premium price. For example, homes in Ka’anapali, one of the popular oceanfront districts, bring an average of $1.4 million, with a range of between $830,000 and $3.5 million for a three-bedroom single-family home. Ka’anapali is one of the most expensive areas on Maui and the concentration of oceanfront real estate is the primary reason. Wailea is another popular oceanfront area in Maui. Here, again, prices have held their value well or increased. In 2014, the luxury home market in Wailea has seen some large sales. Estates with four or more bedrooms on the ocean brought a robust $6.2 million average in 2014, compared to just $3.7 million in 2013. In 2014 the average sale price for three-bedroom oceanfront single-family homes in Wailea was $2.4 million, down just a little compared to $3 million in 2013. The average days on market in Wailea dropped as well, shrinking from 194 in 2013 to 163 in 2014, which is a 16 percent drop. Based on these statistics, Maui oceanfront homes for sale can be a wise choice for the right buyers. 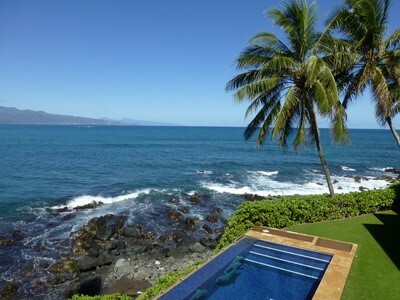 Those who purchase Maui oceanfront real estate for sale are able to benefit from all of the perks of living on Maui. Not only do they have the island's breathtaking views and beautiful beaches at their fingertips, but they also can enjoy the idealistic slower pace of island life surrounded by the luxury of these oceanfront communities, world class golf courses and five star resorts and hotels. Fred Haywood Realty is one of Maui's long established realtors. An Olympic medalist and avid surfer, Fred knows Maui and its finest beaches and areas. Call or email us to meet in person to discuss your next dream home.